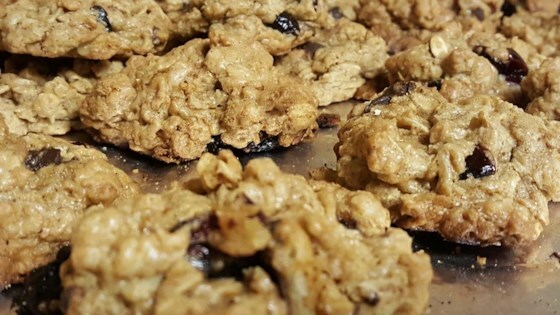 "This is an oatmeal raisin cookie developed to use vegetable oil instead of solid fats. It is a slight modification of one with which I won first place in a company sponsored contest where I work." In a large bowl, mix canola oil, brown sugar, eggs and vanilla until well blended. Combine the flour, baking soda, salt, cinnamon and nutmeg; stir into the sugar mixture. Mix in the oats and raisins last. Drop by rounded spoonfuls onto the prepared cookie sheet. This is not to my liking. The cookies flattened out and you had to overcook them for the middle not to be raw. I definately will not use this recipe again.